In a large bowl whisk together the cream of coconut, corn syrup, egg whites, vanilla, and salt until well combined. Stir coconut and chopped almonds. Lightly spray the lined tins with nonstick spray. Press the coconut mixture into each tin , forming a crust. Place tins on baking sheet and bake for 15 minutes. 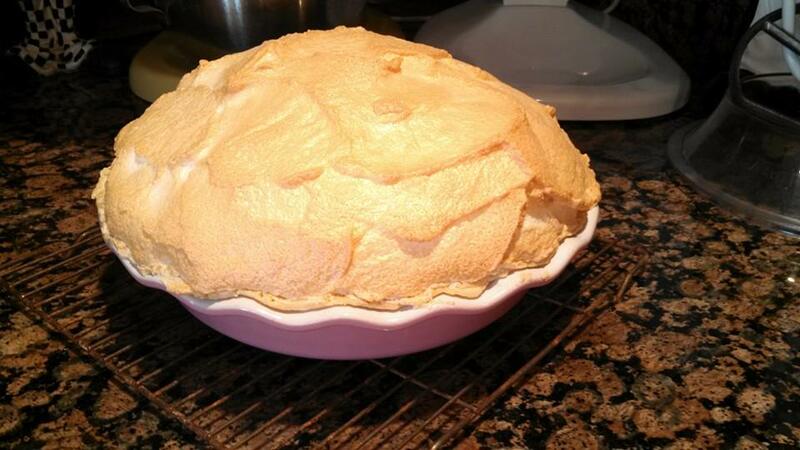 Remove from oven; using the back of the spoon gently press down the center of the crusts, if they have puffed up. Turn off oven and return the sheet pans back to the oven with oven door held ajar. In a large saucepan, whisk the cornstarch, espresso powder, sugar and sat until combined. Whisk in the heavy cream and half-and-half until incorporated. Place over medium high heat, whisk constantly until the mixture begins to thicken and bubble. Reduce heat; continue to cook and stir for 2 minutes longer. Remove from heat. Whisk in a small amount of the hot mixture into the egg yolks. Whisk in the tempered egg yolks back into the remaining hot mixture; whisking constantly. Return to medium heat and bring back to a gentle boil; cook 2 more minutes longer. Remove from heat and whisk in the cooled melted chocolate and vanilla extract until combined. Place the filling in a glass bowl and cover the top with plastic wrap to prevent a skin from forming. Set aside to cool completely. Line a small baking sheet with parchment paper, set aside. In a small saucepan, combine the sugar, water and cocoa. Over medium heat bring to a boil; add the almonds . Continue to cook while stirring until the liquid has evaporated and formed a thick syrup. Pour the almond mixture over the prepared pan and allow to cool completely. Once cool, chop in coarse pieces. Remove the crusts form the oven and allow to cool completely before filling. 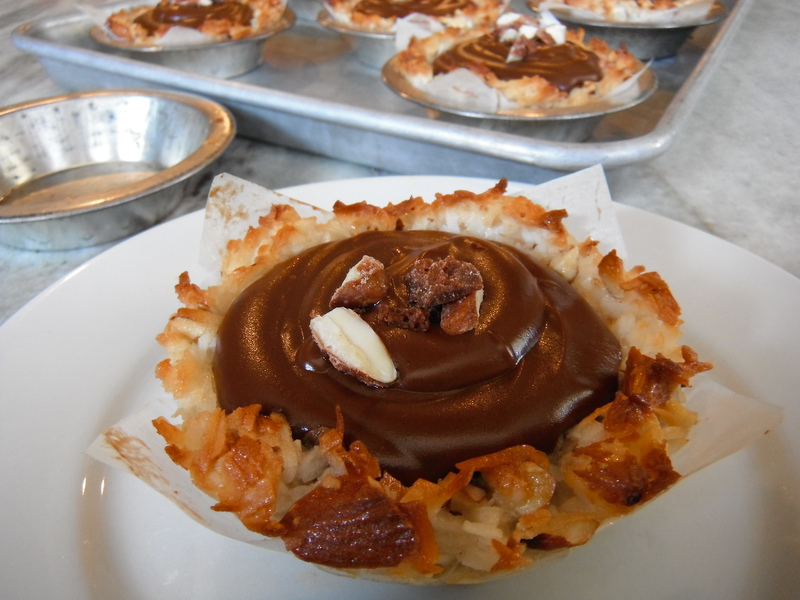 Fill the cooled crusts with the cooled filling and top with the almond topping. 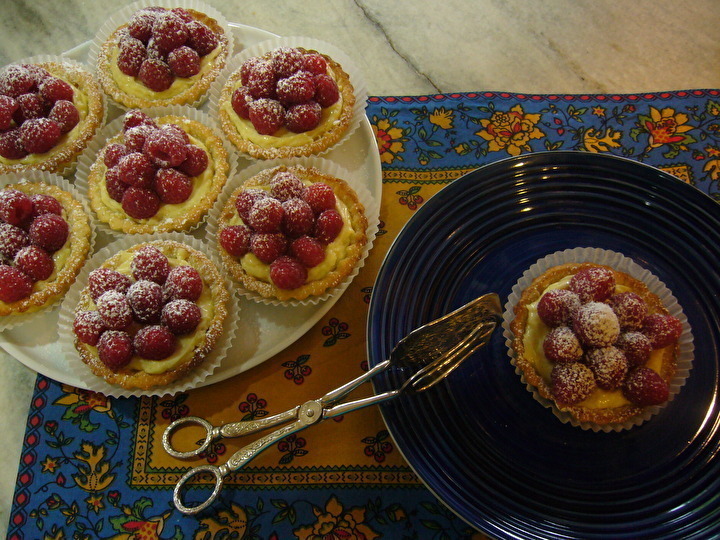 Gently lift the tarts from the tins with the parchment paper liner; serve. Preheat oven to 350 degrees. Line bottom of a 12X18X2 inch baking pan with parchment paper; spray with nonstick spray; set aside. In a large bowl sift the flour, baking soda, spices and salt . In the bowl of a stand mixer cream together the butter and sugar. Beat in the vanilla and add eggs one at a time; combine well. Blend in buttermilk until incorporated. Stir in the blackberry jam and almonds. Pour batter into prepared pan and spread out evenly with a offset spatula. Bake for about 30 minutes or until a toothpick comes out clean when inserted into the center. Remove from oven and allow to cool completely on pan. Using 8cm cake rings, cut parchment paper strips 1 inch taller than the cake ring and enough in length to completely go around inside circumference. Place the parchment sheet inside cake ring like a collar. Cut the sheet cake out into rings using the same size cake rings;set aside. Roll the almond paste out into a thin sheet on parchment paper. Using the same size cake rings, cut out enough almond paste disks as there are cake cut out. In the bowl of a stand mixer combine all the frosting ingredients until well combined and fluffy. Place a collared cake ring on a cake board, serving plate or large muffin liner. Insert a cake into the collared ring. 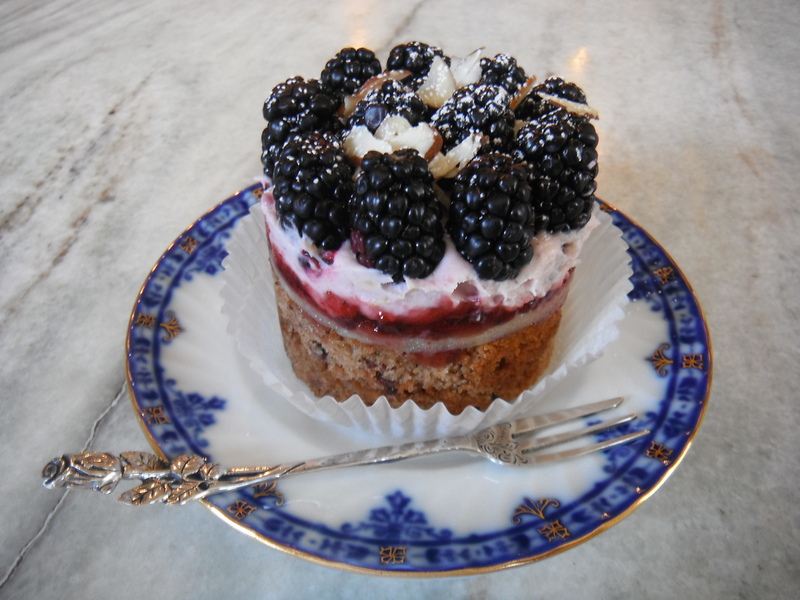 Lightly spread a thin layer of blackberry jam over the top of the cake. Carefully place an almond paste disk over the top of the jam cover cake. Spread another thin layer of jam. Spread evenly to about a 1/2 thickness the frosting over the jam cover almond paste. Place fresh berries decoratively over the top of the frosting, gently pressing in slightly. Sprinkle some toasted almonds over the top. Place the tortens in the refrigerator to set up. Once the tortens are set, remove from refrigerator and gently slide the cake ring off the torten. Gently pull the parchment away from the sides. Dust with powdered sugar. Combine the flour and sugar into a food processor bowl fitted with a metal blade, pulse a couple of times to combine. Add butter chunks and pulse until a coarse meal is formed. Add eggs and process just until dough begins to form. Remove and form into a disk , wrap and chill for at least 2 hours. Butter 8-10(3 1/2 -4 inch ) tartlet pans. Remove dough and roll to a thickness of about 1/8 inch thick and lined each tartlet pan. Place lined pans into freezer for at least 30 minutes. Remove from freezer and prick bottoms with fork. Line each pan with buttered foil and place pie weights in each pan. Bake for about 15 minutes , remove foil and continue until golden. Place on cooling rack , let cool and remove pans from shell. Combine milk, vanilla bean and half the sugar in a large saucepan over medium heat and bring to boil. Meanwhile in a bowl , whisk the egg yolks and remaining sugar until they turn pale yellow and form a ribbon when dropped from a whisk, about 5 minutes. Sift flour and cornstarch into egg mixture and mix until blended. Remove vanilla bean from hot milk mixture and gradually whisk into the egg mixture. Whisk until blended and return to saucepan and bring to boil over medium heat, stirring constantly. Boil , whisking for 2 minutes. Stream cream into mixing bowl. Dot surface with tablespoon butter and stir until melted. Cover top of cream with plastic wrap and allow to cool on rack, then refrigerate until needed. Fill when ready to eat. 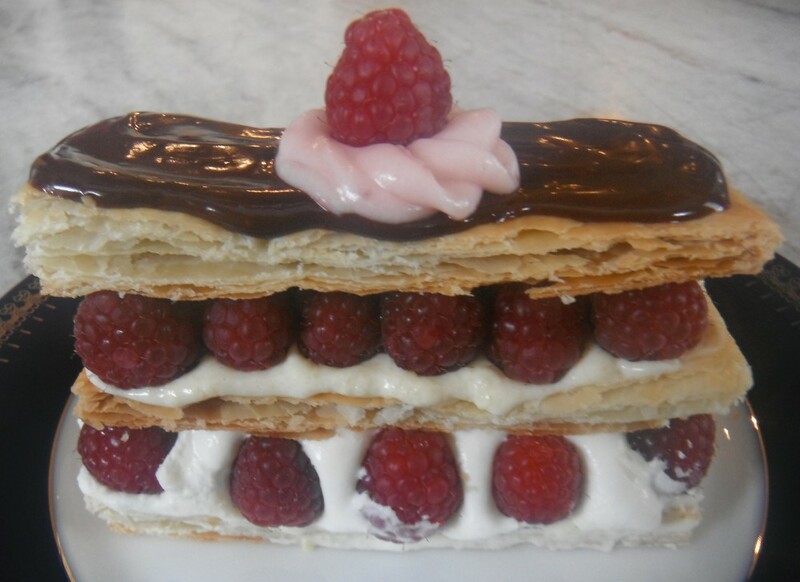 Fill shell with pastry cream and top with berries then dust with powdered sugar. Preheat oven to 350 degrees. Combine all the ingredients; stir to combine. Press into a large deep dish pie plate. Place in oven and bake 10 minutes. Remove from oven and allow to cool completely. Place the chopped chocolate in a separate bowl. Heat heavy cream to just boiling. Pour the hot cream over the chopped chocolate. Stir until smooth and shiny. Pour all but about 1/2 cup of the truffle layer into the cooled crust. Smooth over bottom and sides of crust; set aside. Reserve left over truffle filling for final assembly. 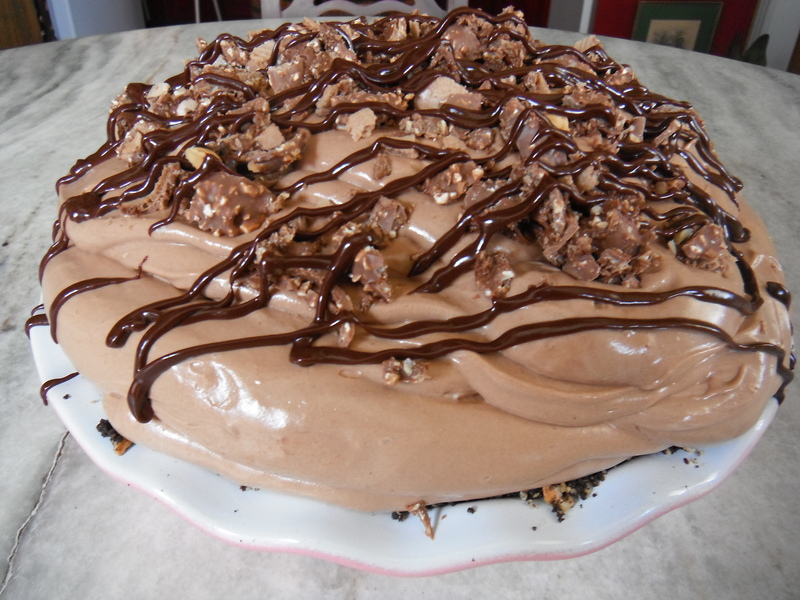 In a mixing bowl whisk the hazelnut spread and marshmallow cream until combined; set aside. In a medium saucepan, combine 1 cup of water and the gelatin. Allow this to rest 1 minute. Over low heat , stirring constantly, dissolve the gelatin. Once gelatin is dissolved, remove from heat and stir in the sugar , vanilla and remaining 1 cup of water. Stir mixture until the sugar is dissolved . Pour into hazelnut mixture and whisk until thoroughly combined. Place mixture in refrigerator and chill until mixture forms mounds when dropped from a spoon. In a large bowl beat the heavy cream until stiff. Fold into the properly chilled hazelnut mixture. Spoon the filling into the truffle lined crust. Sprinkle the chopped bon bons over the top and drizzle the remaining truffle mixture over the top. If the truffle mixture has firmed up too much, gently reheat in microwave to soften to drizzle consistency. Chill for at least 4 hours or overnight before serving. Roll out pie crust and line tartlet pans; prick bottom with fork. Blind bake the tarts, lined with parchment paper and weighted with dried beans or pie weights. When baked until golden at 425 degrees, remove from oven and while tarts are still warm brush inside of tarts with a thin layer of white chocolate. Set aside to cool completely. 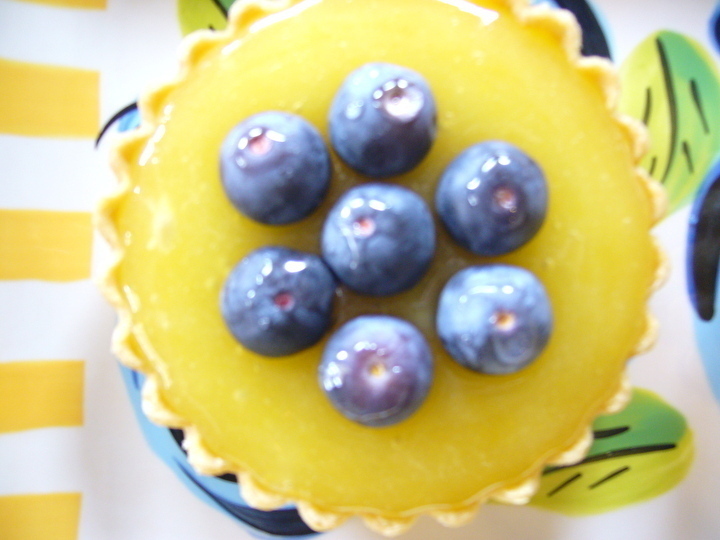 Fill the cooled tart shell with lemon curd . Top with fresh blueberries. Toss the berries in a bowl with the sugar,lemon juice, zest and cinnamon. Thaw pastry sheet as directed on package. Roll out pastry into a free form circle. Place berry mixture in the center of the dough. 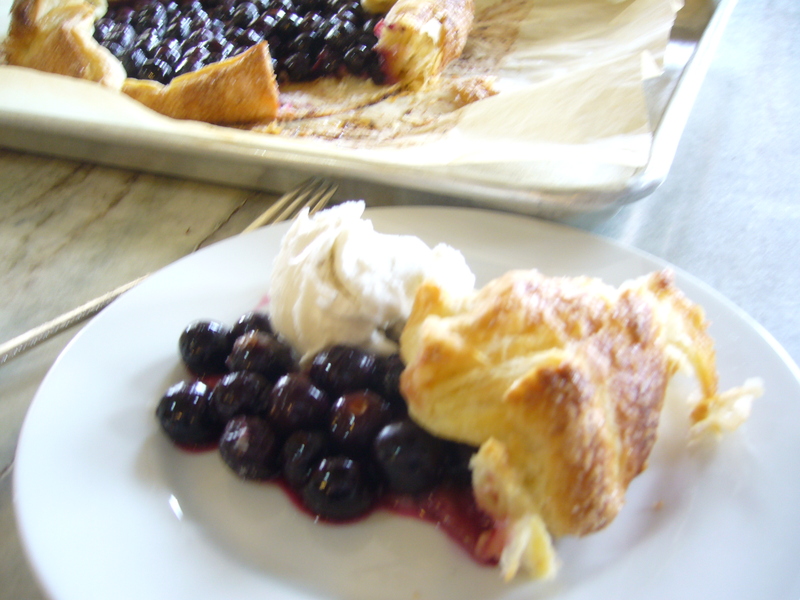 Place on parchment lined baking sheet Spread berries out carefully to with in 2-3 inches of the edges of the dough. Bring edges up over the berries to form outside crust. Brush the crust with the egg wash and sprinkle crust with coarse sugar. Bake in oven until crust is golden. 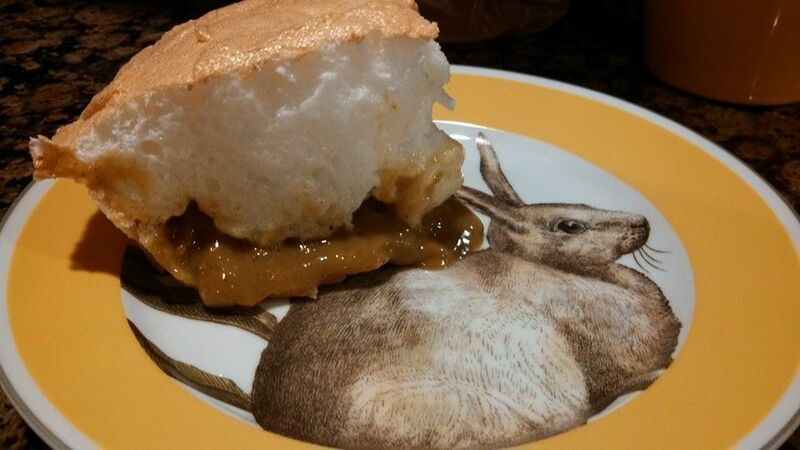 Serve with ice cream, creme anglaise or whipped cream.